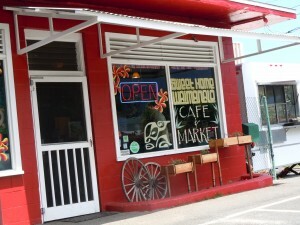 Get Your Gluten Free Baked Goods! 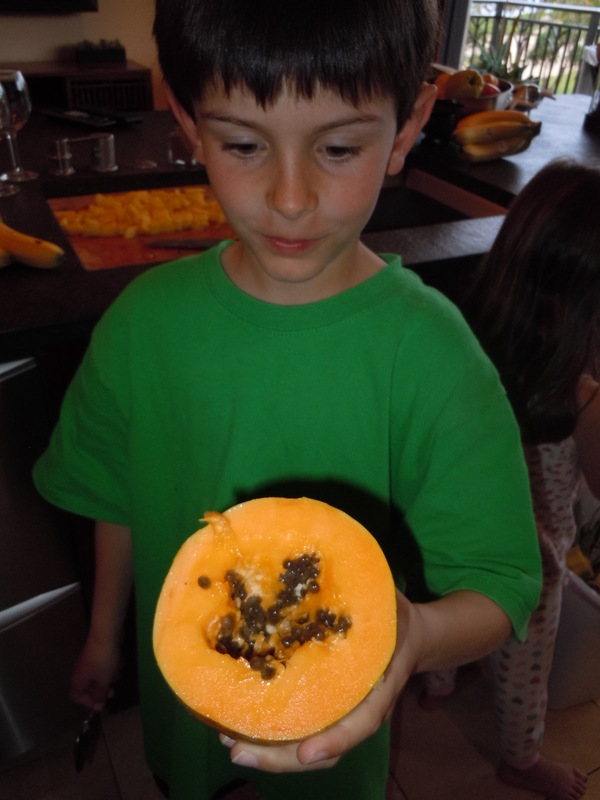 My kids’ school hold a big fundraiser each year for the school garden. This year was no exception. We all had a great time enjoying old fashioned games (bobbing for apples, scavenger hunts), arts and crafts (sewing potpourri sachets, creating art from recycled materials), a pie eating contest, raffle and bake off. In addition there’s a large bake sale. This alone raises over $1,000. I was asked this year to make gluten free desserts for the sale. 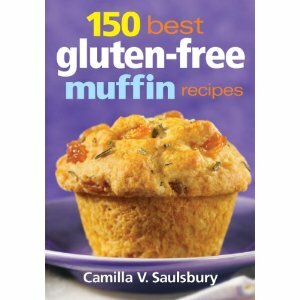 I took the challenge especially since I had recently done some gluten free baking while reviewing the book, Quinoa Cuisine (see review) and I had just received another helpful cookbook entitled 150 Best Gluten Free Muffin Recipes by Camilla Saulsbury. I was baking and testing recipe for weeks. Not only did I test the recipes as written usuing my own mix of flours, but I also decided to try Bob’s Red Mill gluten free all pupose baking flour. They make a great variety of gf offerings for baking. Herein lies all the expense and trouble when people think about gluten free baking. If you don’t have to eat gluten free it is more expensive to properly stock your pantry. For instance the Bob’s Red Mill was $8 for a 2 pound bag. However it was even costlier for me to buy the quinoa, teff and rice flours and mix them myself. Plus there is the worry if you’re buying the flours bulk that can may be contaiminated by a gluten product. 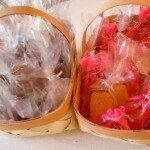 I narrowed down my two favorites and baked multiple batches for the big day. 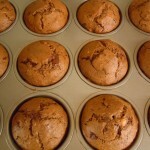 From the 150 Best Gluten Free Muffin Recipes cookbook I made Double Chocolate Banana Muffins and Cinnamon Sugar Muffins. The double chocolate were a huge hit. The banana gave them the right amount of moisture and the chocolate, well there was both whole and cocoa (what’s not to like?). My son liked the Cinnamon Sugar however my daughter and her friend did not. I think it was a texture issue, as gluten free baked goods are denser and the flour is a bit heartier tasting. This book has helpful information about gluten and alternative ingredients. 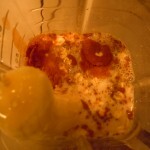 Each recipe also has tips to make it casein-free (which can be a connection for some with other health issues). 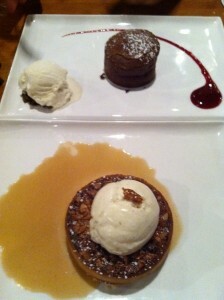 My other choice was the Lemon Glazed Pound Cake from Quinoa Cuisine. I made the pound cake as directed with the quinoa flour, but made it again with the Bob’s Red Mill GF Flour and everyone preferred that one. 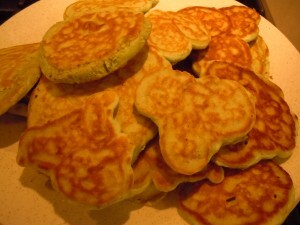 I would make this any occassion – for gluten free needs or not. It was very tangy and had a good dense pound cake consistency. 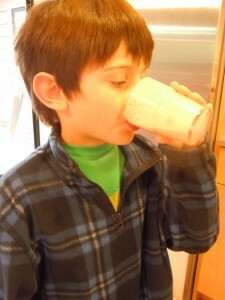 We enjoyed it at home with a bit of vanilla bean ice cream on top during our taste testing. 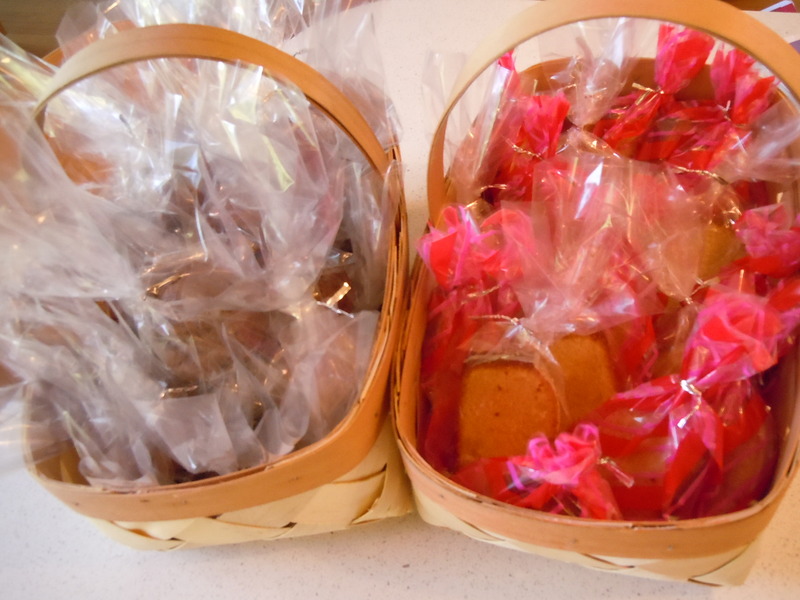 Once I made all the muffins and pound cake for the bake sale, I decided to wrap each individually so someone who needed to stay away from wheat wouldn’t have to worry about cross contamination from the rest of the baked goods at the sale. 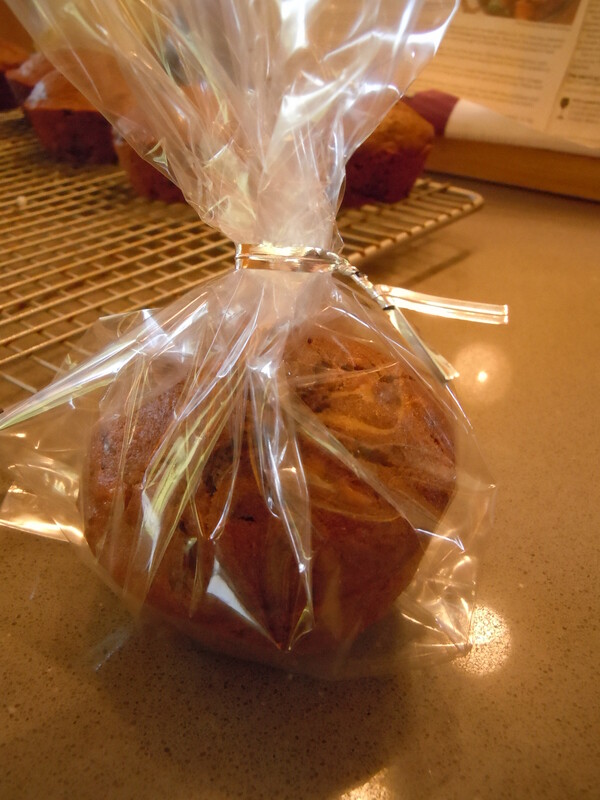 My daughter and I cut and wrapped each piece of pound cake and individual muffin and then tucked them in baskets with ingredient cards on top. They looked great. However when I went over the baked goods table during the event I realized the gluten free items weren’t selling. The moms said not as many were requesting gluten free items, plus maybe it was too hard to see the items in the wrappers. I quickly unwrapped them and luckily they sold. That was an error on my part. A child who’s checking out the baked good options needs to see it and want it, for mom to buy it. Most don’t care if it’s gluten free or not. I went a little overboard with my food safety. Next time unwrap most and wrap only a few for those with celieac and gluten issues. I took those items that didn’t sell home with me. Yes, I could’ve given them away but not with all the time and money that went into them. (Selfish mommy, I know). I froze them and served them to my son’s baseball team a few days later. It saved me some time and they loved them. 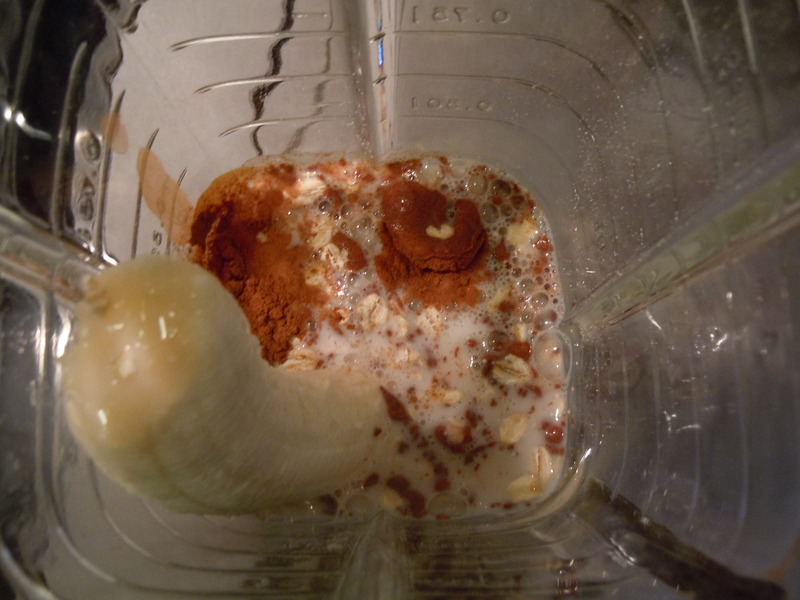 The weather is warming up and now is a good time to get out the blender. I make a variety of different smoothie combinations. 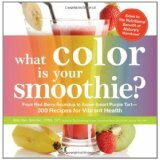 At least I thought I knew a lot, until I received “What Color is Your Smoothie: From Red Berry Round-up to Super Smart Purple Tart” by Britt Allen Brandon. This book makes smoothies out of a huge variety of ingredients and flavors. There are over 300 smoothies in this book to take advantage of every vegetable, fruit, herb and spice in all the colors in the rainbow. I made a few of the fruit combinations of smoothies (especially liked the Blueberry Blast), which tasted great. However I much prefer to add frozen ingrdients instead of ice to make them cold, for a creamier texture (without potential cold lumps). It is fun to choose the smoothie based upon the color. Besides fun, the book also explains the benefits of each color and what vitamins and nutients are at work in each smoothie combination. Pros: lots of variety and combinations. 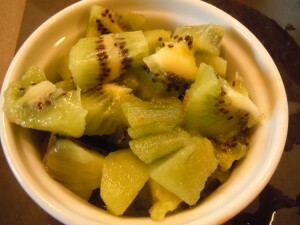 Great inspirational ideas and recipes. Easy arrangement by color: yellow, orange, red, violet, etc. Good produce information. When a steaming hot bowl of oatmeal doesn’t do the trick, maybe the exact opposite is exactly wat you need. Cool, creamy, and sweet this smoothie takes the deliscious flavors of rolled oats, aromatic cinnamon and sweet maple syrup and combines them in an out of the world oatmeal concoction that will take the place of hot oatmeal in anyone’s heart! In a blender combine the banana, oats, syrup, cinnamon and almond milk with 1/2 cup ice and blend until thoroughly blended. While blending add remaining ice until desired consistency is achieved. As if my son’s expanders weren’t enough metal in his mouth now he has braces too. He’s been a real trooper. It takes him much more time to eat and it takes me more time to plan and cut his meals. 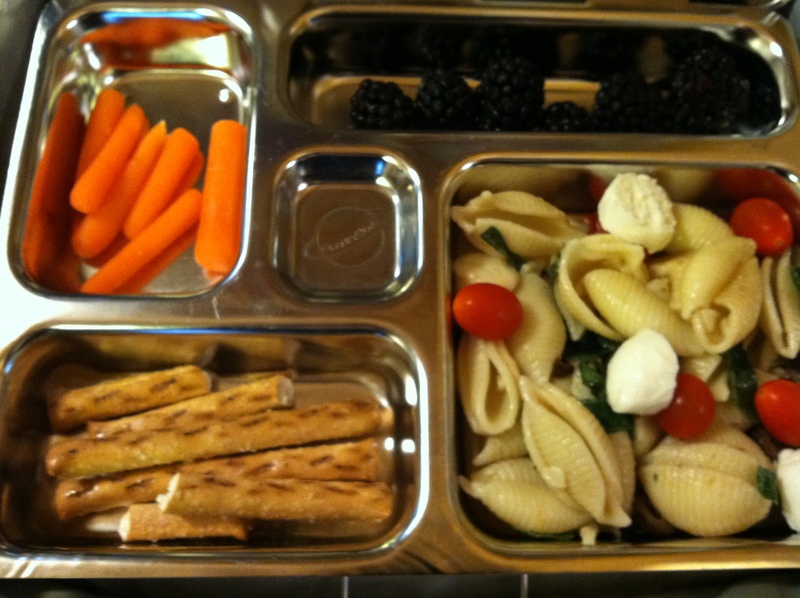 Take for instance his lunch. It’s tough to bite in to a sandwich and not end up with it all stuck to his braces. So now we cut the sandwich in small pieces. 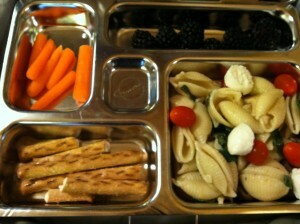 Here’s a photo of the new lunch. Actually eating with a spoon or fork makes things the easiest. Although he doesn’t think lunch should need “dinner utensils”. We’ve worked in a few extra smoothies, shakes, and creamy desserts to keep things sweet and easy when his mouth is feeling achey. 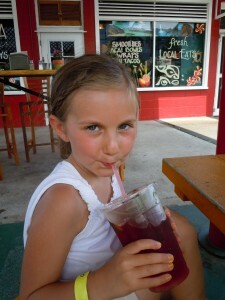 We even tried this new smoothie from What Color is Your Smoothie? 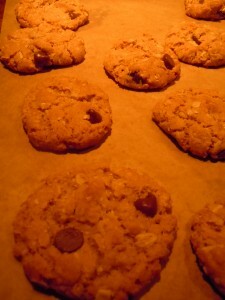 (review soon) that’s made with oatmeal, banana and maple syrup. My family is not new to eating quinoa, however I had no idea how diverse it really is. We use it in pilafs, salads and frittata crusts. But quinoa is a healthy ingredient not only in it’s whole stage, but as flakes and flours and with various colors and properties. 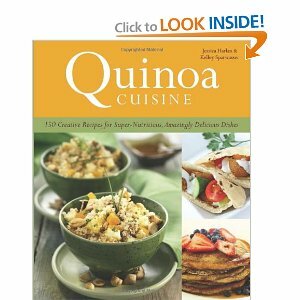 I received the Quinoa book by Jessica Harlan and Kelley Sparwasser. Reading the introduction there is lots to learn. 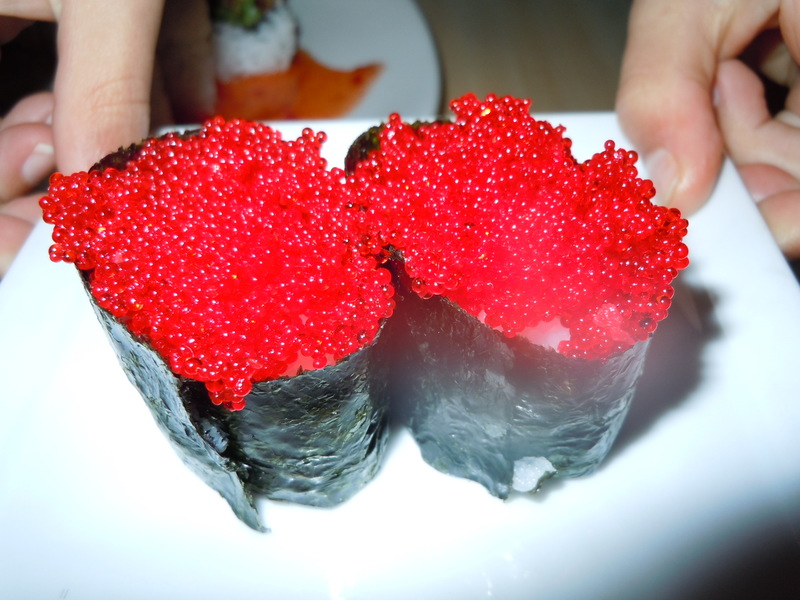 For instance quinoa is not a grain, it’s actually in the goosefoot family related to beets, spinach, and chard. Nutritionists refer to quinoa as a “pseudograin”, like buckwheat and amarynth because it has a similar nutritional profile to true gains and prepared in similar ways. My family wanted to try the baked goods from the book, so I bought quinoa flakes and flour for my pantry (actually needs to be refrigerated ounce opened). The first thing we made was the Rich Chocolate Zucchini Bread (see recipe below). The quinoa flour is more grassy smelling and tasting, so it makes sense to pair the baked items with maybe more sugar or spice or chocolate than you’d (actually I’d) usually use. I went with the recipe and was glad I didn’t cut back on any chocolate chips, after tasting the dough – which is not as yummy as other zucchini breads I’ve made with all purpose or wheat flours. However once baked this was delicious and satisfied everyone’s palate. (While combining these ingredients in photo, I wasn’t so sure). This is also glutten free, so a great recipe to have on hand for potlucks or occassions where gluten free baking may be needed. Unfortunately I cut the bread when it was still warm (yes, I was impatient) and it crumbled. I wrapped the slices in plastic to hold their shape better and store, which worked well. 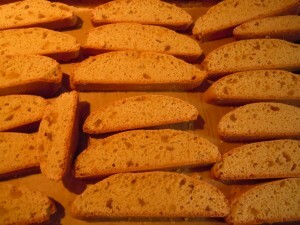 Next we made the Ginger Biscotti. 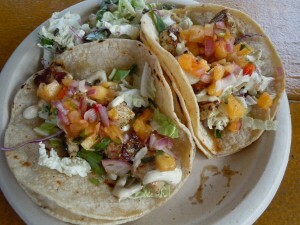 These too were delicious and wheat free too. However I cheated and used half wheat flour and half quinoa. Both because I wanted to try it (they suggest if not baking for a wheat free audience) and because I didn’t want to go to the store for more quinoa flour. These are heavy on the ginger, so be prepared. My son loves candied ginger and thuse these were a big hit as he shared them on a playdate. They get very hard – a true biscotti. So are best enjoyed dipped in coffee, tea or milk. These are great for packaging and gift giving (prettier than my bread above) as they travel well. Overall: I like this book and feel like it is a valuable resource for adding this healthy ingredient to more dishes for my family. I look forward to trying some of the savory options such as the Tabouleh Salad, Bacon Wraped Dates, and Thai Summer Rolls. Pros: I enjoyed learning about quinoa and all the various uses. Also great to know for wheat and gluten free recipes for potlucks and gatherings. Easy to identify icons for gluten free, vegetarian, vegan, freezes well, healthy choice, etc (yes, if you have my books I’m a sucker for icons). Cons: Wish there were photos. Some recipes have more sugars and fats than I’d like to overcompensate for bitter quinoa flake or flours. Some quinoa products may be more expensive and harder to find than traditional grains. 1. Preheat the oven to 350°F. Grease a 9 x 5-inch loaf pan with butter, shortening, or cooking spray. Place the brown sugar, canola oil, and eggs in the bowl of a stand mixer fitted with the paddle attachment and beat at low speed until well combined. Add the applesauce and mix on low speed until combined. 2. 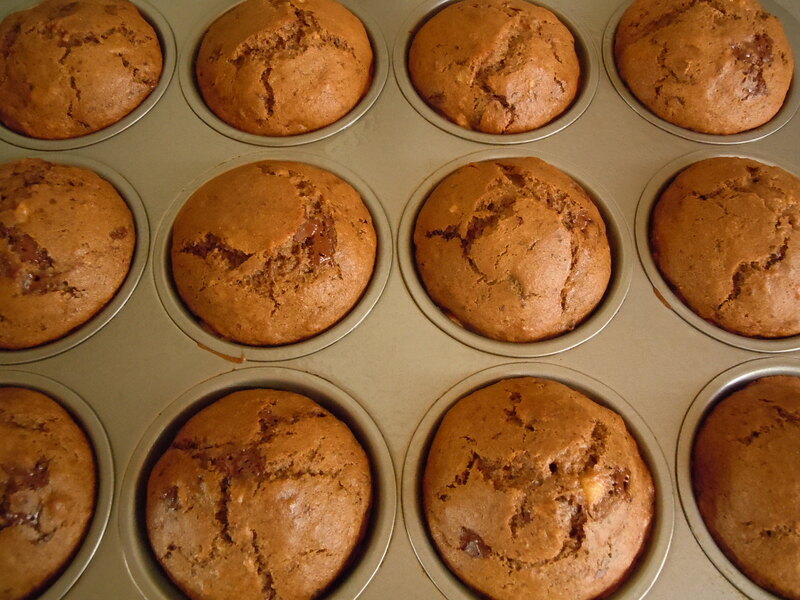 In a medium bowl, whisk together the quinoa flour, cocoa powder, baking soda, cinnamon, and salt. 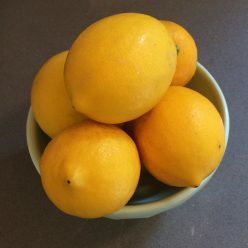 Add to the mixer bowl and beat, beginning at the lowest speed and gradually increasing speed, until the ingredients are smooth and well combined. 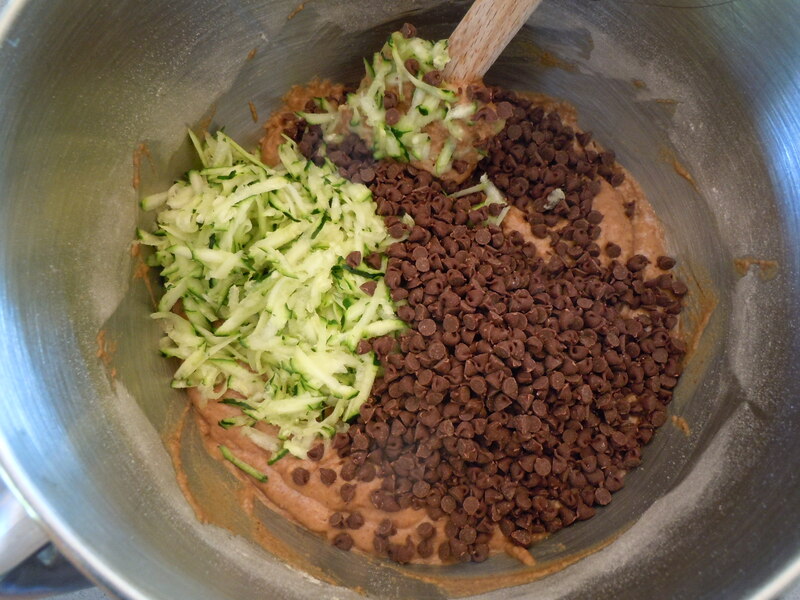 Using a spoon or a rubber spatula, fold in the zucchini and the chocolate chips. 3. Pour the mixture into the prepared loaf pan. Bake until a cake tester inserted into the bread comes out with only a few crumbs clinging to it, about 1 hour. Let cool completely in the baking pan on a wire rack before removing and slicing. 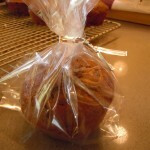 Packaging Tips: To give it a professional look, bake this bread in a disposable paper baker (look for them in kitchenware or baking supply stores or online, such as at www.kingarthurflour.com). Or wrap it tightly in foodsafe cellophane or plastic wrap and tie with a ribbon. For a chocolate-lover’s gift, package the bread with a few packets of hot chocolate mix. My family came over for brunch a few weeks ago. I was feeling a springtime menu and decided to make vegan lemon muffins and chocolate zucchini bread, bagels with lox and all the trimmings, a fruit salad and egg salads. 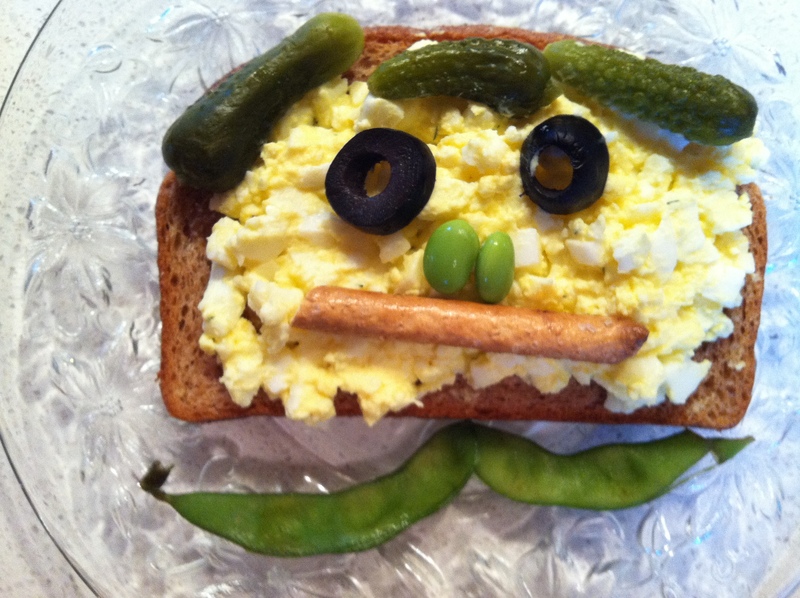 My kids are always up for egg face sandwiches (a work of art below) but I forgot about my old favorite, my Sunny Tofu Salad. This was great because my vegan sister would appreciate this eggless salad. However I realized my recipe is not actually vegan, just vegetarian because I use yogurt. I thought about soy or coconut yogurt but wouldn’t have the neutral taste. Instead I discovered Vegenaise. There’s a whole cold section at Whole Foods with vegan products, which I find very helpful (vegan sausages, cheeses, tofu, seitan). I decided to try Vegenaise, but which one to buy? There’s original, low-fat, grapeseed, soy free and I can’t even remember what else. I was overwhelmed for a moment and then just decided original was the best bet. O.K. I am not a spokesperson and no one gave me a coupon, but let me tell you I am definately a fan. I’m not big on mayonaise, but somehow I like this. It’s not greasy and seems a bit sweeter than mayonaise, and now I have found plenty of uses – cooking vegan and otherwise. It’s lower in fat than mayonaise, but this still isn’t a diet product. 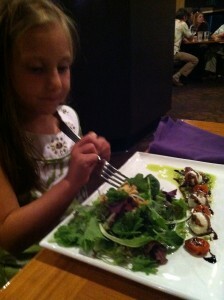 The egg and nonegg salads were a hit with my family, and completely finished. I highly suggest the two “egg” salad options to try to please all kinds of diets at your next brunch (maybe Easter this week) or sandwich face party anytime. The eggless salad is below. You’ll find my Egg and Olive Salad as well as some hard boiled egg tips on a past Easter blog – click here. This was inspired by a sandwich I had from Whole Foods Market. It’s the same idea as egg salad but uses tofu in place of egg. The mustard still gives the sunny color of egg yolks. 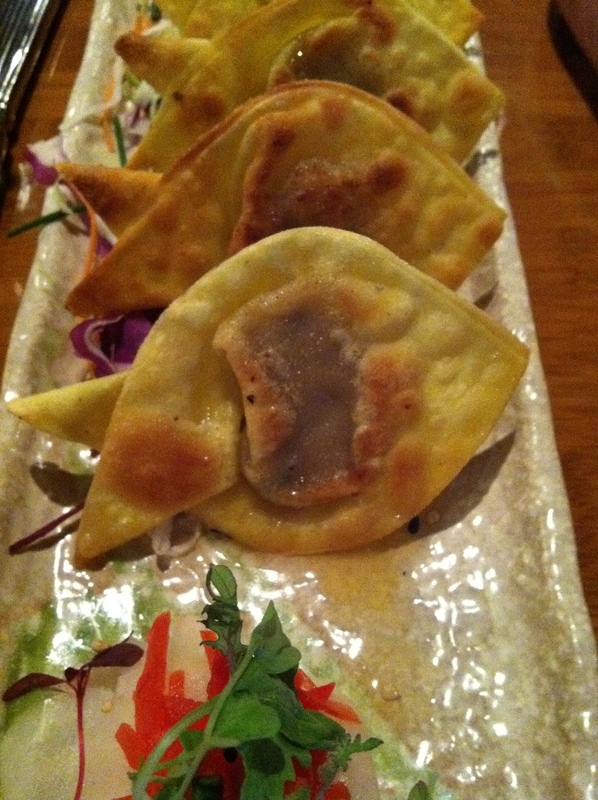 Stuffed into pita bread or rolled into lettuce leaves this is a tasty vegetarian option for those not eating eggs. It is also is a nice addition to a party platter. Place tofu on a cutting board lined with a kitchen towel or paper towels. Gently squeeze tofu between towels to remove excess liquid. Put tofu in a medium bowl and crumble apart using a fork. 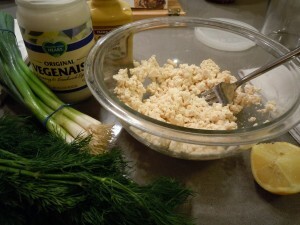 Add yogurt or Vegenaise, green onion (if using), mustard, lemon juice, dill, and salt and mix to combine. Go Green! Be sure to buy organic tofu. Non-organic tofu is more than 84 percent likely to be genetically modified. What do you get for grandparents that say they don’t need birthday gifts? Something homemade of course. My kids are great at making special cards and artwork, but we also like to make baked goods to send in the birthday package too. Who doesn’t enjoy getting cookies in the mail? I make an oatmeal cookie inspired by Oatmeal Cherry Cookies from the Junior League San Francisco Flavors Cookbook (which I helped recipe test for years ago), that has lots of savory spices and then added chocolate chips rather than cherries or raisins (to be honest I was out). There’s not too much chocolate to overpower the spices, which I like. They were a big hit. I made extra so not only did Grandma and Grandpa enjoy them, but our family as well. At our house they went quickly as a sweet treat with hot chocolate on a rainy afternoon. Preheat oven to 350F. Line a baking sheet with parchmnet paper. In a medium bowl combine oats, flour, salt, baking soda and spices. In a large bowl or stand mixer cream together butter and sugars until light and fluffy. Beat in egg yolks and vanilla. 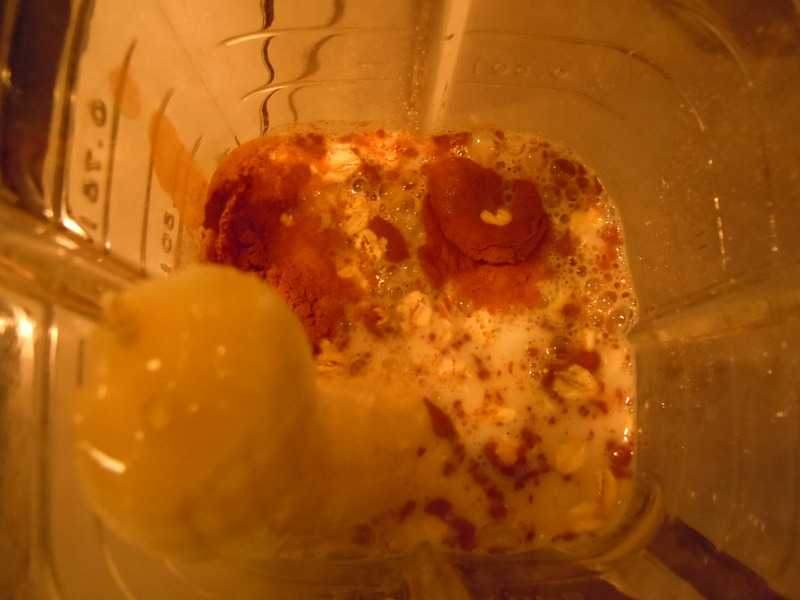 Blend in dry ingredients until all are incorporated. Fold in chocolate chips. Drop tablespoon sized portions of dough 3 inches apart on prepared pan. Bake for 10 – 12 minutes or until lightly browned. Let cool on pan for 3 minutes, then transfer to wire racks to cool completely. 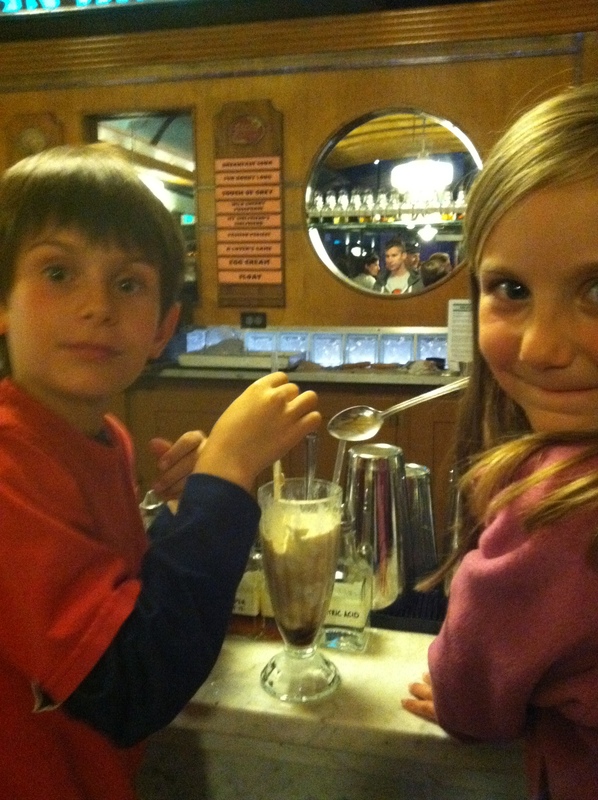 A few weeks ago I saw the “Hot Spot” section in the SF Chronicle and knew my family was going to have to make a pilgrimage to The Ice Cream Bar in Cole Valley. We had a full day in the city starting with the SFMOMA. On Sundays they have fun and creative kids crafts and art activities which my kids really enjoyed. It also gave my husband and I a bit more time to look around at the art we sometimes hurry past because the kids aren’t engaged enough. Next we headed to Cole Valley. We realized we were hungry, so we’d have to put have dinner before heading for ice cream. We found a new favorite for my son, Crepes on Cole. My son loves crepes. 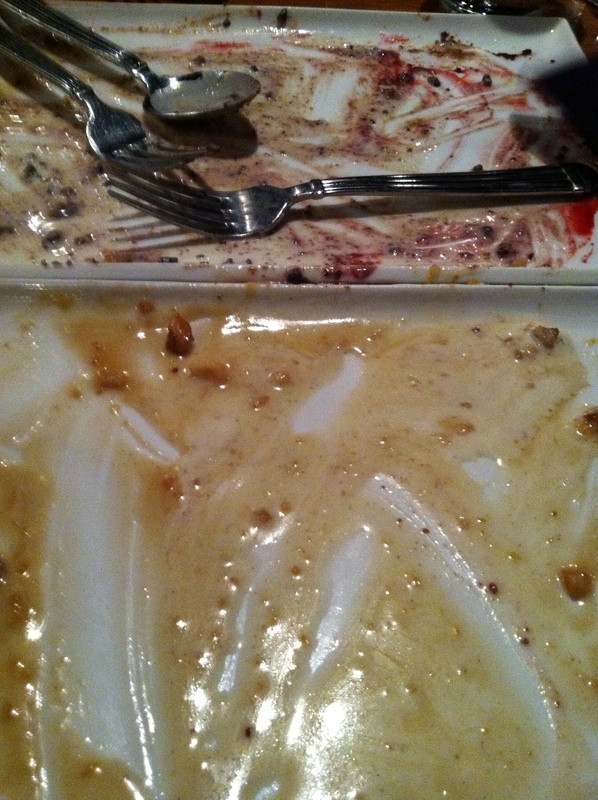 This was a good pick because of all the choices of sandwiches, salads and crepes. There was something to please everyone. 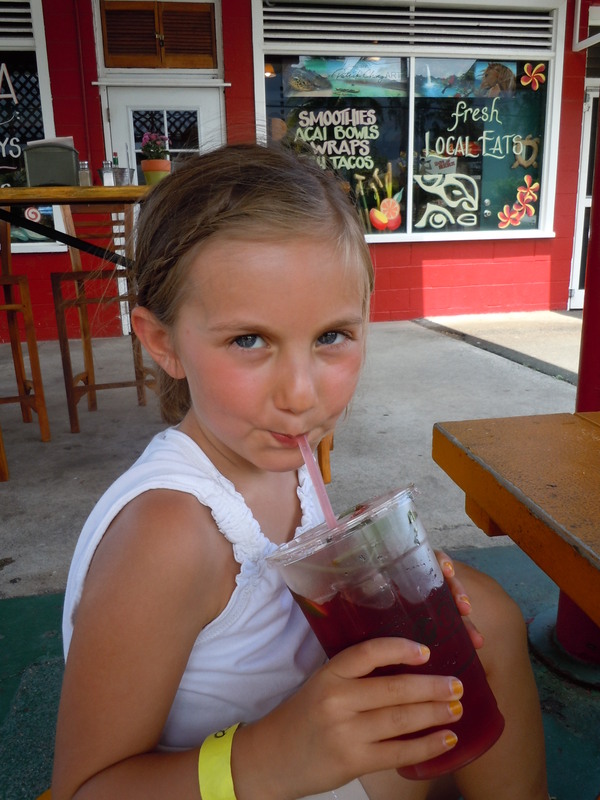 They even had almond milk for my daughter – hurray. Finally it was time to hit the Ice Cream Bar. 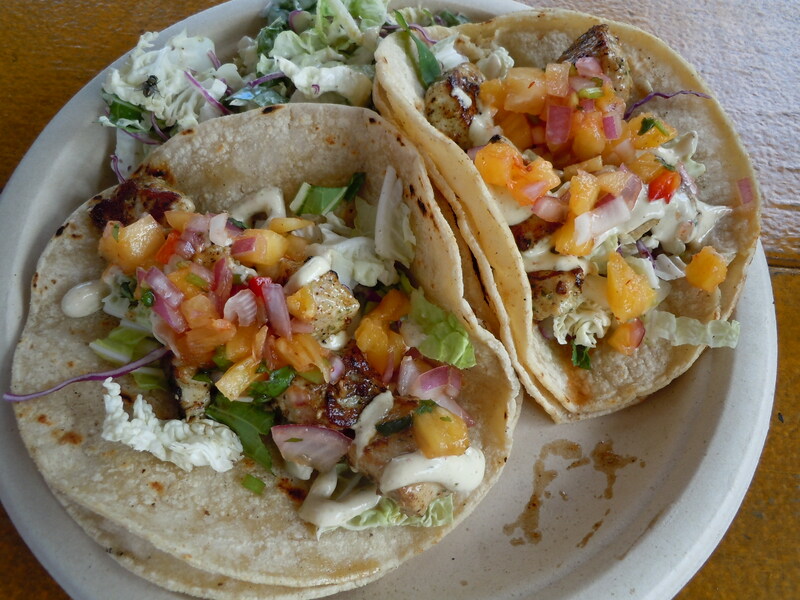 There was a small line out the door for this cool neighborhood spot. Inside there are a few small tables and a bar at the ice cream coolers and another bar in the back. It’s a bit overwhelming at first. You have to navigate the system and lines depending on what you order. Plus keep your eye out for a table or stool. The front ice cream case is for ordering ice cream, sorbet and sundaes. The back bar which looks more like an adult bar (lots of bottles and potions and shakers) is for phosphates, floats and egg creams. 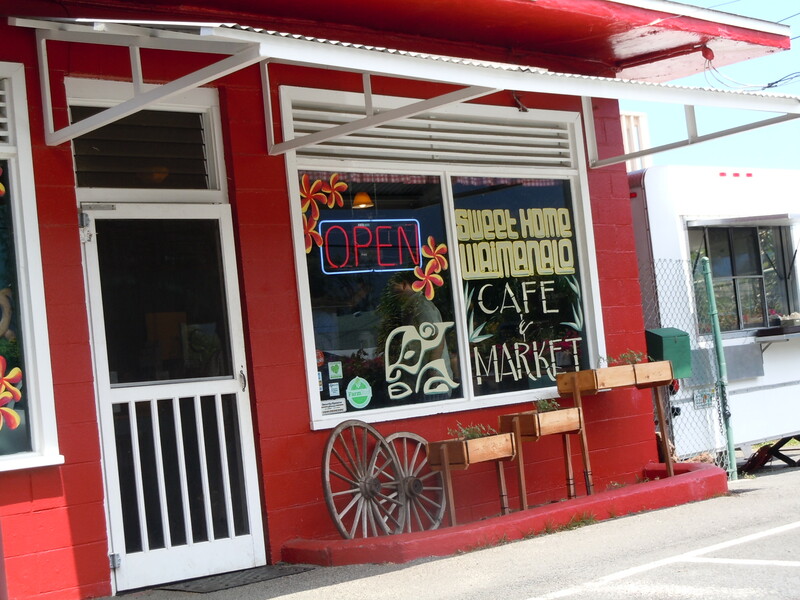 Yes, all those old fashioned favorites are hand made here. 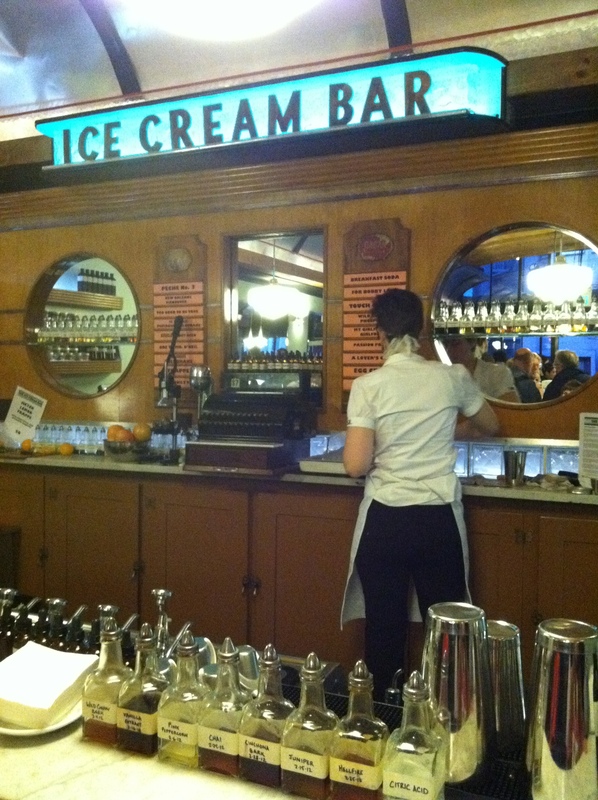 The person behind the bar even crushes ice by hand with an old fashioned metal crusher. I hadn’t seen one since I was a kid. 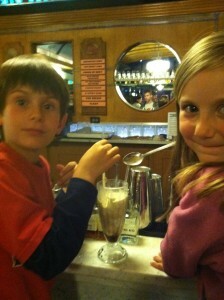 Luckily my kids got stools and shared a root beer float (homemade rootbeer of course). My husband and I stood and had scoops of coconut and chocolate ice cream. It was all very yummy. I’d love to take my parents back. My mom talks about ordering phosphates and hanging out at the local soda fountain with her friends. I have a feeling this is more crowded and hip, but I think it would bring back some tasty memories and stories just the same. Latley I’ve been helping some other sites with blogs and content. 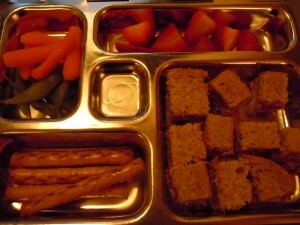 I was very pleased to be part of a three week blog series with feeding babies on Ginger Garner’s site. Ginger is founder of Professional Yoga Therapy (PYT), the first education program for Complementary and Alternative Medicine practice in medical therapeutic yoga in the United States. Ginger has traveled across the US teaching yoga and Pilates as Complementary and Alternative Medicine, while also raising awareness about mothers’ rights and improving women’s health. She also is a mother of three. Her youngest James, is eating my apple puree above. Sometimes I get so wrapped up in my daily life with school age kids, I forget about new babes coming into the world. Then I see a cute photo or read a kind email or post about a mom feeding their baby for the first time, and I wish I was right back there. 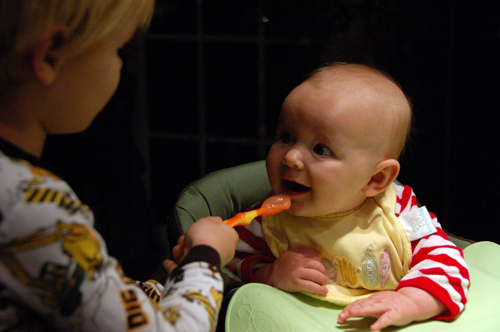 If you’re looking for tips for feeding babies and a recipe for apple puree – a perfect first solid food, please see my guest posts here. We had lots of excitement over St. Patrick’s Day. First my daughter’s kindergarten class made leprechaun traps to try to trap leprechauns and get their gold. These are usually sweet, glittery boxes with rainbows and stars. However there were a few that seemed a bit unkind – spikes and water to keep the poor green guy in the box. Luckily the leprechaun’s stole the marshmallows (apparently what they eat) and just left a bit of mess (think toys on the ground, glitter dust and bead necklaces left behind). 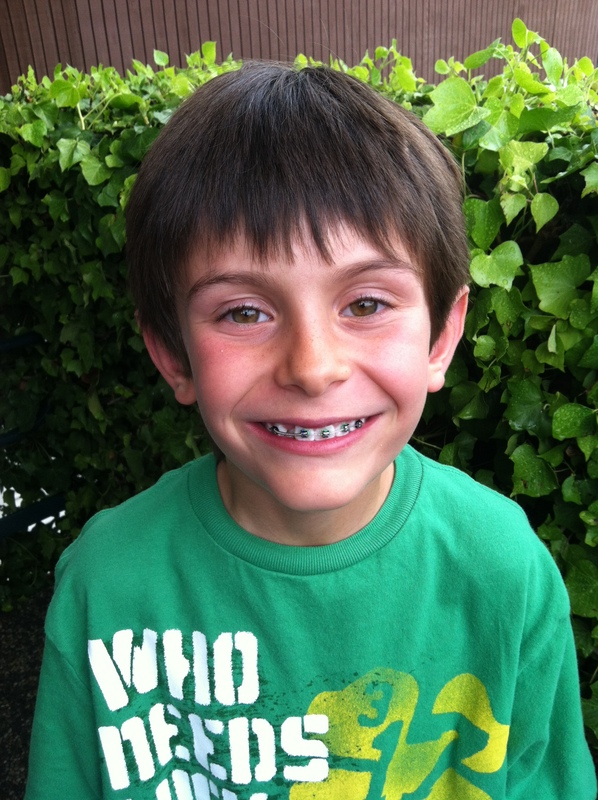 My son also got his braces on last week. 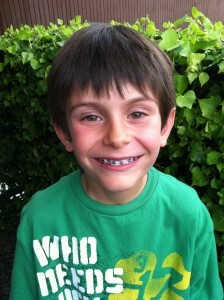 Because the next day was spirit day and the day before St. Patrick’s Day he chose to get green bands on the braces. 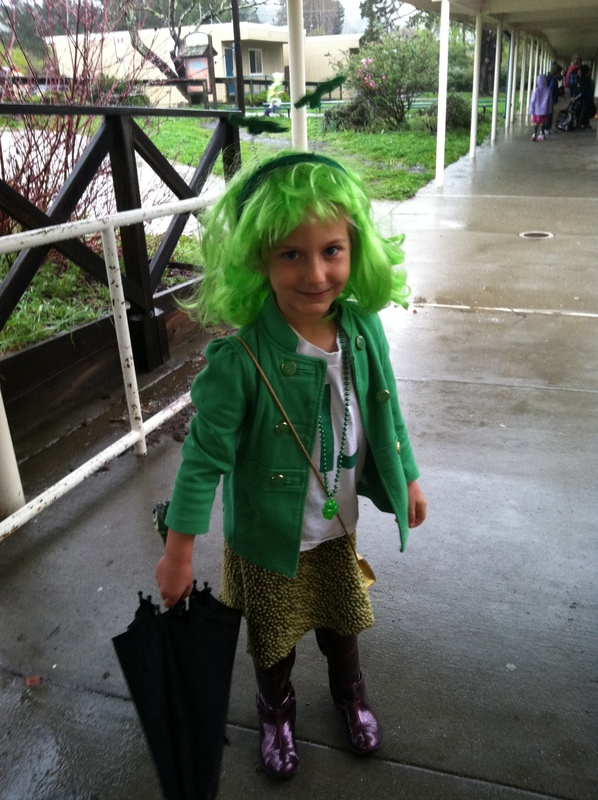 Not to be outdone by her brother’s new green smile, my daughter put together her own green. She was easy to spot and made up for any other students lacking green spirit. 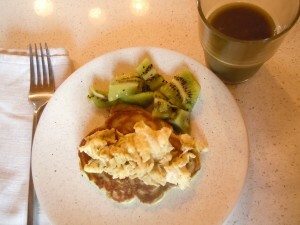 This year St. Patrick’s Day was on a weekend so I had some time to make green shamrock pancakes (added food dye), green eggs (added pesto), cut kiwi and green juice (mix of fruits and spinach in belnder). I must say the kids loved it. It wasn’t very appetizing looking. But every once in a while it’s fun to hear a squeal at the breakfast table with a bit of surprise and “magic”.